Which Is Worse: Artificial Sweeteners or Sugar? It's a tough choice at the coffee shop milk station: do you go with the yellow or pink packet of artificial sweetener, knowing it will add zero calories but possibly contain harmful chemicals? Or the white packet of natural table sugar because it's, well, natural? It's a debate nutrition and weight-loss enthusiasts regularly engage in, believe it or not. And while the stakes may not seem so high at the coffee shop, the choice between regular soda and diet starts to add up pretty quickly. Regular sugar is supposed to be more wholesome since it wasn't made in a lab, but there are so many health issues associated with sugar consumption, it's easy to understand why people are scared of the white stuff. Artificial sweetener, on the other hand, supposedly tricks your brain and influences the same metabolic responses as sugar. Plus, it's full of weird chemicals. But there are no calories! So which one is the better option? Natural sugar goes way beyond traditional table sugar. There's sugar in the raw varieties, coconut sugar, agave nectar, honey, and the oft-demonized high-fructose corn syrup. Honey and molasses are often turned to instead of table sugar because of their natural properties, but they have the exact same glycemic index as sugar, according to gastroenterologist and obesity medicine specialist Dr. Nitin Kumar of the Bariatric Endoscopy Institute. Agave nectar is sometimes lauded as a healthier alternative because it has a lower glycemic load -- which basically means it's supposed to jack up your blood sugar levels more slowly -- but it's still very refined and processed, according to Dr. Kumar. It also has a high fructose content, which means it has similar properties to high-fructose corn syrup; they both convert sugar into fat more easily than table sugar. Even with all the different fancy names for sugar, they're all more or less the same. Except HFCS, which should still be avoided like the plague. With artificial sweeteners, things get a little more muddled, mostly because there are so many different FDA-approved types. Aspartame is the most common ingredient you'll find in sugar-free processed foods, like diet soda. It's also sold in little packets under the brand names Equal and NutraSweet, and is 200 times sweeter than sugar. Dr. Kumar says that unlike other sweeteners, which generally just pass through your body, aspartame is metabolized into compounds found in natural food. It's considered safe in small amounts, except for people with phenylketonuria, a genetic disease. Sucralose, also known as Splenda, passes through the body easily and does not build up in body fat. It's also 600 times sweeter than sugar, so a little goes a long way. 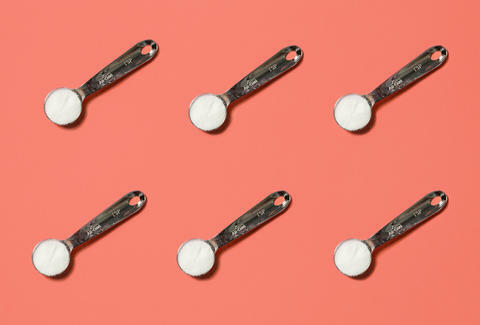 Saccharin, or Sweet'N Low, is a little more controversial; saccharin was deemed unsafe after a study in 1978 found a connection between the sweetener and bladder cancer in rats. But subsequent studies have found no clear correlation between saccharin and cancer in humans, since we process it differently than rats do. Go figure. More recent research suggests it could even help inhibit cancer cell growth... wait, what? Even though the National Cancer Institute says it's safe for consumption, the 300-times-sweeter-than-sugar sweetener hasn't been as popular since the whole late-'70s debacle. Stevia, which is about 300 times sweeter than sugar, has been touted as the latest, healthiest artificial sweetener because it comes from the Stevia rebaudiana plant. A plant, that must be good! It has zero calories, and Dr. Kumar says it can result in lower glucose and insulin levels after meals than sugar. But overall, the hype could be more marketing than scientific fact; while Rebaudioside A, also known as stevia extract, has been deemed generally recognized as safe by the FDA, pure stevia has not been given the same stamp of approval. Overall, artificial sweeteners are generally all on the same playing field anyway. "As far as the long-term health effects of using artificial sweeteners, the FDA has recognized some artificial sweeteners (saccharin, aspartame, sucralose, stevia extract) as 'generally recognized as safe,'" Dr. Kumar explains. "Because they generally pass through you without being digested (except aspartame), and because they have been studied extensively in labs, they are accepted as safe for long-term use (other than aspartame in people with phenylketonuria)." "Safe" is one thing, but most people turn to artificial sweeteners as a way to reduce calorie consumption. That's where things get a bit trickier. The verdict is still out on whether sugar-free sweeteners cause people to consume fewer calories overall. Although they would appear to (diet soda is calorie-free! ), some studies claim that artificial sweeteners give you an increased appetite. But most of the research on it is conflicted, so doctors can't really say for sure either way. So which one is better? Conventional wisdom still holds; moderation is key both with artificial sweeteners and natural sugars. For someone looking to lose weight, artificial sweeteners are probably your best bet. "Table sugar and modified sugars could be less safe than sweeteners if you consider that they increase calorie intake and increase blood sugar levels," Dr. Kumar says. "For someone trying to control blood sugar and/or lose weight, sweeteners can have a role as a sugar replacement." Ultimately, though, if you can stomach it, NO soda of any kind is your best bet, especially with the science still out on artificial sweeteners and their link with obesity. But for overall health, table sugar or natural sugar is the way to go -- just not too much of it! "Artificial sweeteners have recent medical studies showing safety, but table sugar has centuries of chemical safety data," adds Dr. Kumar. "We have a lot of long-term safety data for table sugar, but it should be used in moderation." Try and avoid modified sugars such as HFCS and agave nectar; they're the worst category overall. All things being equal (zing! ), you might as well reach for the table sugar for your coffee. One white packet only has 15 calories, and if the rest of your diet is pretty free of added sugars, it shouldn't be a problem (PSA: the USDA recommends no more than 25g of added sugar a day; one packet of sugar is about 4g). Just make sure you're reading your labels carefully; calories still count at the end of the day, and aspartame, sucralose, or stevia aren't an excuse to have a sugar-free free-for-all. Christina Stiehl is a Health and fitness staff writer for Thrillist who will always pick stevia over sugar (old habits die hard). Follow her @ChristinaStiehl.